After the story of how police shot and killed an innocent father during a raid on the wrong house died down, authorities quietly announced that no charges will be brought against the officer who pulled the trigger. January, the Wichita District Attorney announced that there will be no charges. According to Kansascity.com, on Thursday, District Attorney Marc Bennett said he had to make a determination based on Kansas law and law handed down by the Supreme Court, which says that when determining if an officer acted reasonably, evidence has to be reviewed based on what the officer knew at the time of the shooting, not 20/20 hindsight, he said. The DA’s office also stated that they will keep the officer’s name a secret because he will not be charged. During a press conference on Thursday, the Wichita police department released multiple other body cameras showing the summary execution of Finch. Those videos are below. Barriss was arrested on a felony warrant shortly after police killed Finch. He has since been charged with involuntary manslaughter for Finch’s death, giving false alarm, and interfering with law enforcement. What about the officer who pulled the trigger? All of the attention surrounding the fact that this shooting resulted from a “swatting” prank has covered up the fact that the shooting itself was carried out by a police officer who shot and killed an innocent, unarmed father. 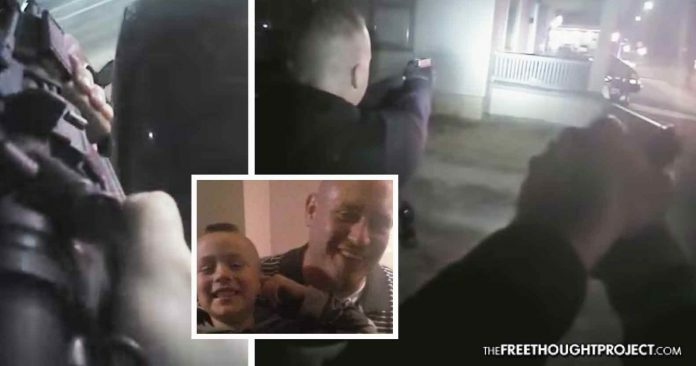 The family’s attorney, Andrew M. Stroth, who has since file a civil rights lawsuit against the police department said it was a difficult call to make to tell the family of Finch that the officer who took their father and son’s life won’t be charged. “When we received the information from the district attorney, I called Lisa (Finch’s mother) and told her the decision,” said Stroth. “The family’s devastated and the family is disappointed by the decision of the district attorney today,” he said. The murder of Andrew Finch was tragic, and while Tyler Barriss should be held accountable for his actions, that should not take away from the fact that a police officer shot and killed a man who never once put threatened their lives or tried to hurt them. Not to mention the fact that he opened fire on a house when he believed there were family members inside.